Check out Reckon and comment on this post letting me know your favorite item. For a second entry, let me know in a separate comment that you are a natalie's sentiments follower. For a third entry, grab my button and place it in on your blog. (It is on top of my left hand sidebar.) Let me know in a separate comment that you have done so. For a fourth entry, Blog about this giveaway extravaganza and leave a comment on this post providing me the link. 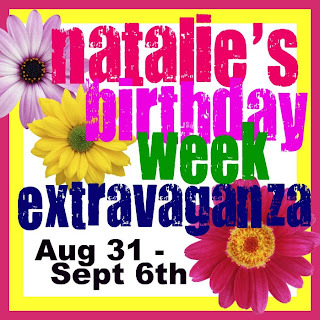 You only need to blog about the extravaganza once to get the extra entry on all 7 giveaways! I will announce the randomly selected winner on September 8th. Good luck! Want to see what I want to win?? Check it out here. I love the Audrey Hepburn onesie. The Elvis baby onesie is great, but I'd love the Dolly Parton pink one for my baby girl. Hey! 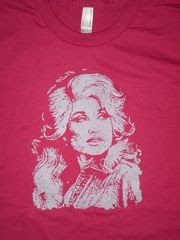 I have that Dolly shirt. It's my favorite. Ohhh....lve the elvis and the dolly onesies! I think my 6 month old would look pretty hip in the Elvis onesie! I love the Bob Dylan Onesie. However, if I win I want the Dolly Parton onesie for Emma. So cute!!! The elvis one is so cute!! I love the dolly parton onesie, but my best friend is having a boy, is from Texas, and would LOVE the Elvis onesie! I follow your blog religiously! I want the Elvis one for my little boy!! So cute!! I have already blogged about the giveaway!! I love the Audrey Hepburn and Dolly Parton onesie for my almost ten month old little girl. That Elvis onesie has me swooning! This is perfect b/c Elvis is my favorite shirt on the site!!! I also LOVE the Dolly onesie! I'm a huge fane! I have my 1st baby boy coming this month, I would love to see him in the Elvis onesie!!! Love the Clint Eastwood onsie!! I think I like the Shakespeare onesie! That's awesome. They need a Jim Morrison onesie, though. I do have your lovely button on my sidebar of my blog. Me Me Me please! I want to dress my daughter up for the fair!!!! I would choose the Clara Bow Onesie if I won for our new baby girl who we will name clara! For some reason, I really would LOVE the Jack Kerouac shirt for my son. 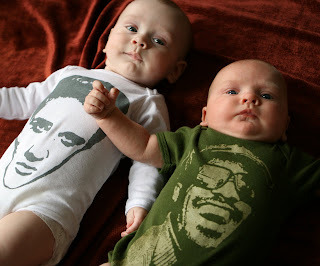 I would go for the Bjork onesie if any of my girls were still babies :). Maybe the MLK for my baby. I love the Elvis and Audrey Hepburn onesie!! Super cute! I LOVE the Clint Eastwood tee! Would look sooooo cute on my two year old Ethan! I love ELVIS, he is one of the reason I wanted to move to TN...from Scotland, gotta love Dolly too!My 10 mth old boy would look great in either. I am a happy follower every day. MY favorite Morrissey l/s tshirt toddler. The Elvis onesie is so cool!